California's Pacific Gas & Electric Co. will start switching off power to minimize sparks in vulnerable areas during times of extreme fire danger, it said Thursday, as state investigators examine whether the utility's equipment set off deadly Northern California wildfires. Jodi Hernandez reports. California's Pacific Gas & Electric Co. will start switching off power to minimize sparks in vulnerable areas during times of extreme fire danger, it said Thursday, as state investigators examine whether the utility's equipment set off deadly Northern California wildfires. The move for pre-emptive power cutoffs is one that some local officials and fire survivors have urged after recent wildfires. PG&E and some other state utilities previously have resisted it, arguing that cutting off power carries its own risks, including to patients dependent on electrical equipment. The change was one of a slate announced Thursday by the utility in the aftermath of Northern California wildfires that killed 44 people last October, and have left the utility facing what could be hundreds of millions of dollars — or even more — in liability. The California Department of Forestry and Fire Protection still is investigating the causes of the spate of October wildfires. Records released so far in the probe show that tree limbs or whole trees fell into power lines in the areas where many of the near-simultaneous fires began, whipped up by fierce dry winds. PG&E is making sweeping new changes to gear up for fire season. Their plan includes replacing wood power poles, hiring their own firefighters & opening a 24 hour Wildfire Operations Center. PG&E is now drafting guidelines for shutting down power in areas at risk during extreme fire danger, spokesman Matt Nauman said. Any temporary shut-offs would likely happen during California's summer and fall fire season, and would be done in coordination with officials and with public notice, Nauman said. "Turning off electric power lines can have an immediate and broad impact on public safety," Nauman said. "At the same time, we recognize that there may be situations in which proactively turning off electric power lines is warranted." San Diego Gas & Electric in Southern California cut off about 12,000 customers during high winds and wildfires last December, only to have some customers complain, that utility said. PG&E also will talk with communities to "determine where it makes sense to underground" power lines, or bury them underground rather than run them above ground on poles, Nauman said, in another change called for by some officials in areas hit by fires. Even buried lines are vulnerable to weather damage, quakes, flooding, and unwitting damage from heavy equipment, PG&E officials say. The utility also plans to make its electrical system more resilient against high winds and fire, including replacing some wooden poles with steel. Other planned changes include an around-the-clock wildfire prediction and response center in San Francisco, and the hiring of firefighters on retainer. PG&E suspended shareholder dividends late last year, citing rising potential for significant liability in the deadly October fires. 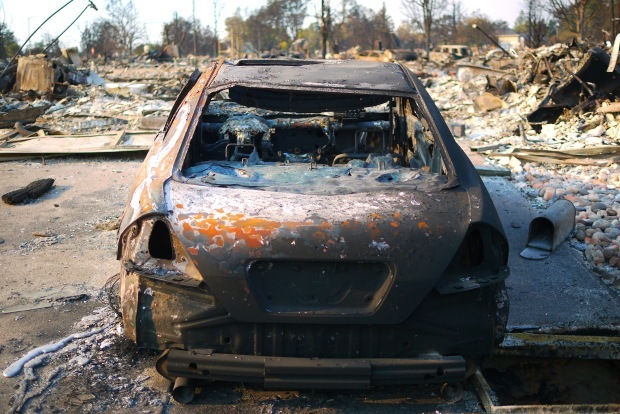 State investigators and courts earlier found PG&E responsible for a 2015 fire that killed two people and burned hundreds of homes and other structures in and around the northern Sierra Nevada. PG&E in that fire had failed to cut back brush around its equipment, leaving a pine tree to slump against a power line, investigators said.